Description: NASA’s SR-71 streaks into the twilight on a night/science flight from the Dryden Flight Research Center, Edwards, California. Mounted in the nose of the SR-71 was an ultraviolet video camera aimed skyward to capture images of stars, asteroids and comets. The science portion of the flight is a project of the Jet Propulsion Laboratory, Pasadena, California. Description: Three SR-71 aircraft were used at different times during the 1990s by NASA as test beds for high-speed and high-altitude aerodynamic research. The aircraft, two SR-71A and an SR-71B pilot trainer aircraft had been based hear at NASA's Dryden Flight Research Center, Edwards, California. One early research project flown on one of Dryden's SR-71s consisted of a proposal for a series of flights using the SR-71 as a science camera platform for the Jet Propulsion Laboratory (JPL) of the California Institute of Technology, which operates under contract to NASA in much the way that NASA centers do. In March 1993, an upward-looking ultraviolet (UV) video camera placed in the SR-71’s nosebay studied a variety of celestial objects in the ultraviolet light spectrum. The SR-71 was proposed as a test bed for the experiment because it is capable of flying at altitudes above 80,000 feet for an extended length of time. Observation of ultraviolet radiation is not possible from the Earth's surface because the atmosphere's ozone layer absorbs UV rays. Study of UV radiation is important because it is known to cause skin cancer with prolonged exposure. UV radiation is also valuable to study from an astronomical perspective. Satellite study of ultraviolet radiation is very expensive. 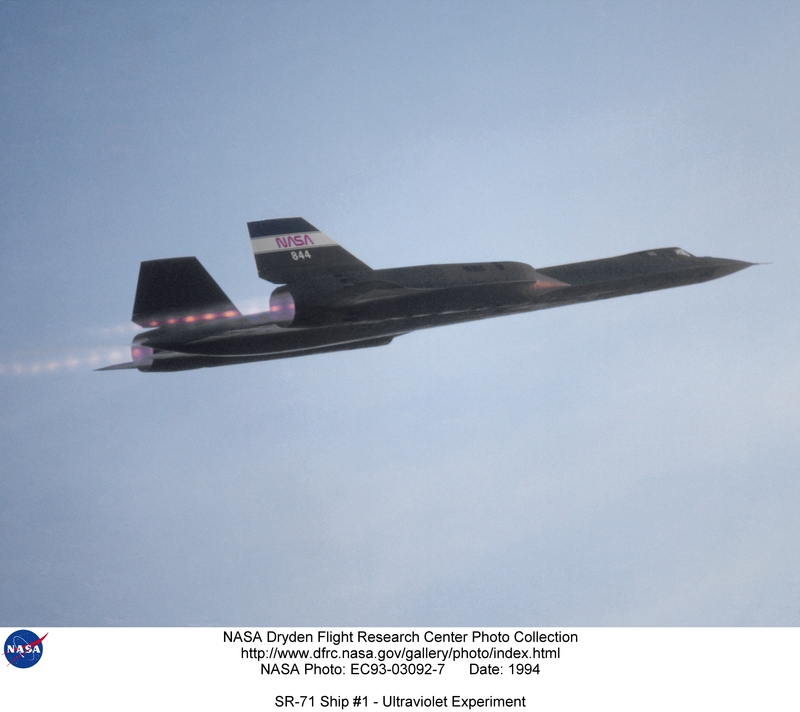 As a result, the South West Research Institute (SWRI) in Texas developed the hypothesis of using a high-flying aircraft such as the SR-71 to conduct UV observations. The SR-71 is capable of flying above 90 percent of the Earth's atmosphere. The flight program was also designed to test the stability of the aircraft as a test bed for UV observation. A joint flight program was developed between the JPL and NASA's Ames-Dryden Flight Research Facility (redesignated the Dryden Flight Research Center, Edwards, California, in 1994) in conjunction with SWRI to test the hypothesis. Dryden modified the nosebay of the SR-71, creating an upward-observing window to carry SWRI's ultraviolet CCD camera so it could make observations. According to Dryden's SR-71 Project Manager Dave Lux, a single flight of the aircraft confirmed the aircraft's capability and stability as a test bed for UV observations. SWRI's principle investigator was Dr. Allen Stern.